Pioneer U-05 review | What Hi-Fi? The Pioneer U-05 is one eye-catching machine. If you’re not attracted by the glint of shiny metal, you’ll be pulled in by those big XLR headphone connectors that dominate the front panel. It could be intimidating, but the U-05 DAC and headphone amplifier is an enthusiastic performer that gets our toes tapping. Clear, zippy and open, the U-05 is a fun listen. Its naturally pacy rhythm and precisely drawn edges give songs an upbeat vibe that’s immediately appealing. Public Service Broadcasting’s Gagarin sounds snappy and fast flowing – just what the funky tune needs. The trumpets blare with just enough bite to reel you in, but there’s never a harsh moment. Strings are pulled taut, drums hit accurately – although we could do with a touch more low-end oomph and muscle. The Pioneer reaches highs and lows with conviction, so there’s enough drama present when you get caught up in a Hans Zimmer soundtrack. There’s clarity and detail in spades, too, regardless of file type. Whether you’re listening to a 24-bit/96kHz recording of Kate Bush’s 50 Words For Snow or a Spotify stream of ’90s alt-rock band Soul Coughing, the Pioneer sounds remarkably clean and spacious. Next to class-leaders such as the Audiolab M-DAC, the Pioneer’s detail retrieval holds up well. It could, however, do with a touch more subtlety – in the warmth and inflections in voices and the twanging reverberations when a string is plucked – to get us more engaged. The presentation is by no means cold or hard, but we wouldn’t mind a richer, more fluid performance. There’s little else to complain about though – this is an entertaining DAC. The Pioneer’s aluminium chassis is sturdy and beautifully machined, and the little retro touches such as the shining metal edges around the buttons or the perfectly cut slice on the volume dial make it worth the money. Available only in silver, the U-05’s look should still appeal to many. The large display is informative and easy to read, and can be dimmed or turned off using the remote control. With large, responsive buttons, the compact remote makes using the U-05 a breeze, and it’s also handy for switching between Pioneer’s sonic filters. It’s worth trying the three digital filters (we prefer the ‘Sharp’ option), and switching between the Up sampling (samples all songs to 32-bit/384kHz) and Direct modes. 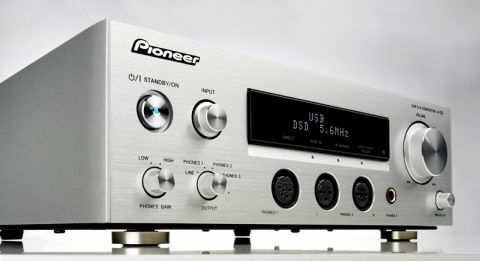 The Pioneer U-05 is one of the most well-connected DACs of its kind. Not only do you get the popular USB type-B input, coaxial and optical (two inputs each), and a 6.3mm headphone jack, you also get two balanced XLR connectors for headphones and an AES/EBU input. When you’re spending premium money on a DAC, it’s good to have options. All digital inputs can handle 24-bit-192kHz high-resolution files, while the USB input goes one step further by supporting 32-bit/384kHz files and DSD. Most popular file formats – WAV, FLAC, ALAC, MP3 – are also supported. The Pioneer U-05 is a solid, appealing machine that feels like a premium piece of hi-fi – and it sounds like one, too. There are subtler, more refined performers for similar money (our Award-winning Audiolab M-DAC is the clearest rival here), but that shouldn’t deter you from giving this entertaining DAC a listen.